Moussa Koussa flew into Britain and told Foreign Office staff he was “no longer willing” to serve the regime. The move was welcomed in Whitehall where fears have been growing that poorly organised Libyan rebels cannot defeat Gaddafi without being given arms or training on the ground. “We encourage those around Gaddafi to abandon him and embrace a better future for Libya that allows political transition and real reform that meets the aspirations of the Libyan people,” a Foreign Office spokesman said. David Cameron had earlier admitted that the Government was considering arming the rebels following talks in London with Libyan opposition leaders. Rebel forces were forced to retreat again and surrendered several towns in the face of heavy resistance from troops loyal to the regime. Uganda announced that it was prepared to offer the Libyan leader exile under an Italian plan to remove him;The UN or EU may ultimately have to send a humanitarian force to help civilians in rebel–held areas. The British and other governments are increasingly worried that rebel troops will not be able to advance on Tripoli or other Libyan cities without external help. Arming them is thought to have been discussed by Britain’s National Security Council and Mr Cameron, President Barack Obama and the French president Nicolas Sarkozy have begun openly considering the idea. Last night it was reported that Mr Obama had signed a secret order authorising covert US support for the rebels within the past two or three weeks and that CIA and MI6 operatives had been in the country for some time. It is understood that Libyan opposition leaders have requested anti–tank weapons and other equipment, which could be provided by a Middle Eastern country, such as Qatar, in return for oil. Yesterday, Mr Cameron said that Britain was not “ruling out” arming the rebels, despite having previously indicated that this may not be possible under the terms of sanctions imposed on Libya. Mr Cameron’s statement echoed comments by Mr Obama in a television interview on Tuesday night.Russia and other countries have strongly condemned any such provision. It would be highly controversial and may be blocked by MPs in Britain. 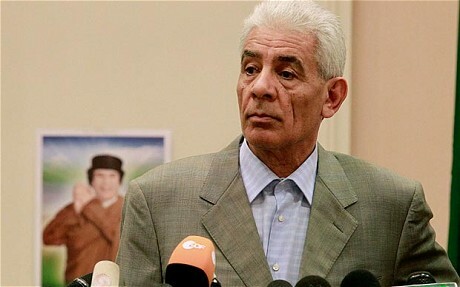 However, Mr Koussa’s defection holds out hope that the regime might still crack from the inside, relieving the pressure for further military measures. Mr Koussa flew from Tunisia, where he had been on a diplomatic mission, to Farnborough airport before being shuttled to London for immediate talks with high–ranking Foreign Office officials. A close confidant of Gaddafi for 30 years, he was linked by intelligence sources to the Lockerbie bombing and played a lead role in securing the release of the bomber, Abdelbaset Ali Mohmed al–Megrahi. Yesterday, senior defence officials said there was “more to do” to prevent further loss of civilian lives but reiterated that no British ground troops would be used. A chaotic picture emerged on the ground where the Gaddafi regime ambushed rebels outside the leader’s home town of Sirte, precipitating a disorderly retreat as far as Ajdabiyah. Profile Regime’s chief fingernail puller’Moussa Koussa, 61, took a sociology degree at Michigan State University. He was appointed ambassador to Britain in 1980 but expelled for threatening to kill opponents. He was accused of organising terrorism on his return to Libya where he headed the Libyan spy agency from 1994 and was described by a senior figure in George W Bush’s administration as “chief fingernail puller”. He has been named as the possible architect of the 1988 Lockerbie bombing, but brokered Libya’s promise to give up weapons of mass destruction in 2003 and was made foreign minister in 2009.